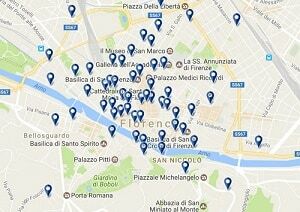 Florence hotels located in the historic center and within walking distance of Florence’s sightseeing highlights. The hotels are organized by neighborhood. We also provide some suggestions for 5-star hotels, 4-star hotels, and affordable Florence hotels. Book online with confidence knowing that you’ll receive the lowest price and you may contact ItalianTourism.us directly with any questions or problems. 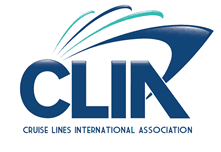 If you are looking for a trip to Florence with airfare and even add some escorted tours check out the Florence vacation packages. 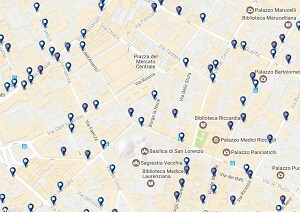 Florence accommodations around Florence’s historic center includes various neighborhoods. From the area around the train station Santa Maria Novella, to the Duomo and Uffizi areas considered the center, to Santa Croce these areas are Florence sightseeing favorites. 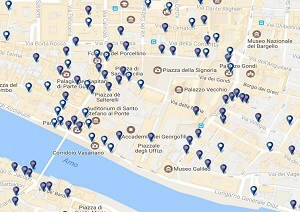 For those who want to stay in a Florence hotel around Italy’s famous designer boutiques then look at the Tornabuoni neighborhood. Across the Arno River is the Pitti Palace located in the Oltrarno neighborhood. 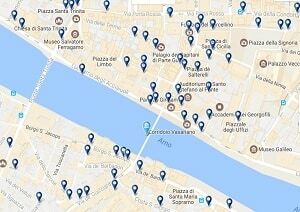 And located along the Arno River are Florence hotels in the Ponte Vecchio area. 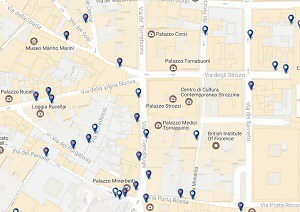 Florence Hotels located around the Duomo are right in the center of Florence. This is primarily a pedestrian area crowded by day with the throngs of visitors strolling Florence’s streets with eyes gazed upward at Brunelleschi’s Dome and Giotto’s Bell Tower. The Ponte Vecchio is the famous bridge over the Arno River. Hotels located around this area enjoy river views and easy walking access to all of Florence’s historic center. 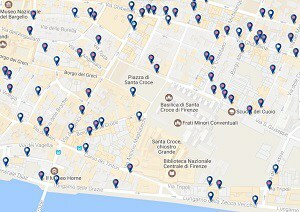 Hotels in Santa Croce neighborhood are slightly off the main tourist track where there is more space to stroll. Nevertheless, this area in Florence’s center is close to everything including the Uffizi and Duomo. Florence is known for its delicious food and fine leather and gold. Around the San Lorenzo area you’ll find the Mercato Centrale Firenze and San Lorenzo markets to shop for both and more. The Medici family chapel Basilica San Lorenzo is located here, which is where the area takes its name. 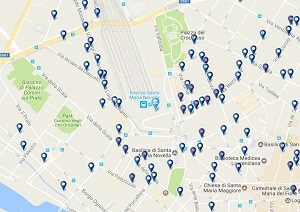 For those looking to shop stay in a hotel around Via Tornabuoni. Here you’ll find all of Italy’s high fashion boutiques. Take out your wallet and just window shop, either way your show to have a marvelous time dreaming of high heels and new leather jackets. Located on the less-traveled side of the Arno River, Hotels in the Palazzo Pitti area enjoy a relaxed Florence vacation location with less tourists. The area is also known as the Oltrarno neighborhood. In addition to the Palazzo Pitti, there is the Boboli Gardens to enjoy and trattorie serving Tuscan food full of local Florentines. 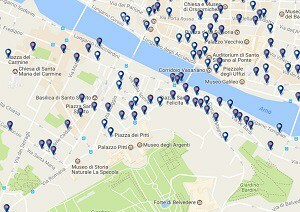 Find Florence hotels located around the world-famous Uffizi Gallery. Here among a sea of people you’ll enjoy easy access to Piazza della Signoria, art galleries, the Arno River, and the Duomo area. Florence’s train station is across the park from the beautiful 13th century Santa Maria Novella basilica. 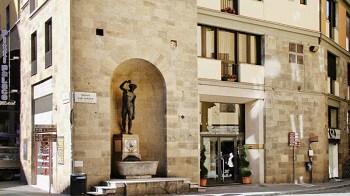 Florence Hotels around Santa Maria Novella are convenient if traveling by train to or from Florence. And the area just steps away from Florence’s Duomo and its museums and other sightseeing attractions. 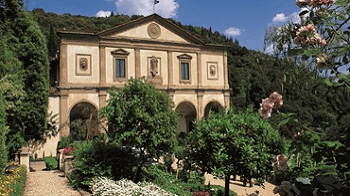 Located on a hill overlooking Florence, Fiesole is a quiet area full of 5-star resorts. Set among ancient Etruscan settlements Fiesole will appeal to those looking for a Florence hotel located around beautiful greenery and boasting fabulous views. 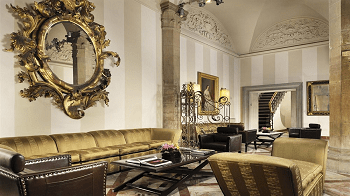 Located 100 yards from the Ponte Vecchio, set along the Arno River, owned by Florence’s Ferragamo family, this Florence hotel has a convenient location, exceptional service, and includes original modern art including Picasso and 4 Cocteau. This may be one of the finest hotels in Florence. Click here to find the lowest price at Florence’s hotel Lungaro. Stay amid one of the largest private gardens in the city, bordered by an ornate Renaissance palazzo. Enjoy opulent and inviting Florence luxury hotel rooms – along with signature Four Seasons service – as you relax, dine and celebrate in beautiful and historic spaces. 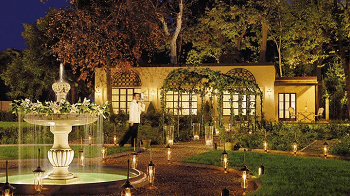 Click here for the lowest price on one of Florence’s finest hotels the Four Seasons Firenze. Stay among Etruscan settlements with beautiful views of Florence. Belmond Villa San Michele is a former monastery on a hilltop amid lush trees and terraced gardens. It dates back to the 15th century. The Villa’s façade is attributed to Michelangelo. The elegant rooms come with terracotta floors and Carrara-marble bathroom. A Kids Club and Kids concierge service are provided here. Wi-Fi and parking are free. Click here to find the lowest price at the Villa San Michele. The 5-star Westin Excelsior is 1,650 feet from Santa Maria Novella Train Station and a short walk from the historic centre. Located on the banks of River Arno in Florence’s historic Piazza Ognissanti, The Westin Excelsior offers luxurious rooms and suites, many overlooking the river and the Oltrarno area. Ponte Vecchio is 2,950 feet away. It is surrounded by some of city’s most popular restaurants and designer boutiques. Click here to find the lowest price at the Westin Excelsior Florence. Right on the Arno River with stunning views of the Ponte Vecchio, The St. Regis Florence is in a historic building designed by Brunelleschi. Featuring a Michelin-starred restaurant, this 5-star hotel features a spa and gym, and luxury rooms with antique furnishings. Santa Maria Novella Train Station is just over a quarter mile away, and the cathedral is just over half a mile from the property. 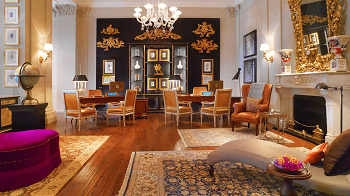 Click here for the lowest price on one of Florence’s finest hotels the St. Regis. Grand Hotel Minerva features a rooftop swimming pool, where you can enjoy the bar and sun terrace with views of historic central Florence. Santa Maria Novella Train Station is just 1,000 feet away. Some rooms have views of Florence Cathedral, just 1,650 feet away. To book one of the best Hotel values in Florence click here. Featuring a Florentine garden, the peaceful San Gallo Palace is a 15-minute walk from the Accademia Gallery and Uffizi Museum. Its location is somewhat removed from the historic center. Its a quiet area. Hotel is great value. It offers classically furnished rooms with parquet flooring, and free Wi-Fi throughout. Click here for guaranteed best price on the San Gallo hotel Florence. 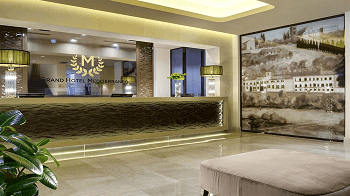 Grand Hotel Mediterraneo is set on the banks of River Arno, 0.6 miles from Piazza Santa Croce. This location is out of the main hustle and bustle of Florence. Some rooms have panoramic views of the river, of the hills surrounding Florence, or of Piazzale Michelangelo on the other side of the bridge. All rooms feature parquet floors and marble bathrooms. For more information or to book the Grand Hotel Mediterraneo click here. 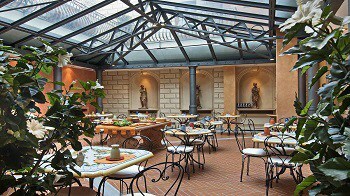 Grand Hotel Cavour is located in the Duomo area in Florence’s historic center. It has a rooftop terrace with views over Florence Cathedral. The Uffizi Gallery and the Ponte Vecchio are both less than 1,950 feet from the Grand Hotel Cavour. The Cathedral of Santa Maria del Fiore is just a few steps away. Click here for the guaranteed lowest price on the Grand Hotel Cavour. 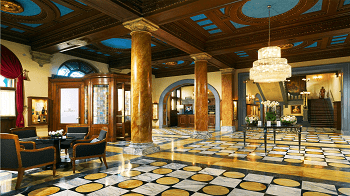 Grand Hotel Adriatico is in Florence’s centre, a 10-minute walk from Florence’s Duomo and the Ponte Vecchio. Each room at the Adriatico Grand Hotel has wooden floors and furniture. All rooms are air conditioned and feature a flat-screen TV with satellite channels. 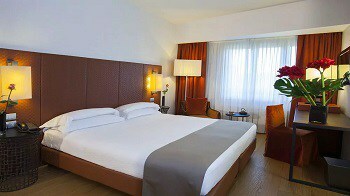 Click here for the guaranteed lowest price on the Grand Hotel Adriatico. The Michelangelo Florence is near the Stazione Leopolda conference center and a 10-minute walk from Santa Maria Novella Train Station. It is 20-minutes walk the Duomo. Set in the 13th-century Rossi Tower next to Ponte Vecchio and Pitti Palace n the Oltrarno area, Hotel Pitti Palace features a panoramic roof terrace with beautiful city views. 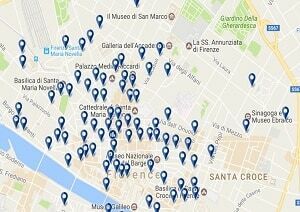 The Uffizi Gallery is a 5-minute walk and Duomo about 10-minutes across the Arno River. The rooms at Hotel Pitti Palace al Ponte Vecchio include windows overlooking the Arno River or the surrounding medieval city area. 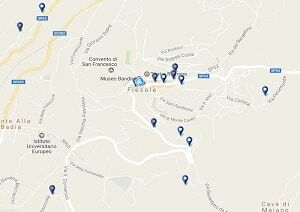 To plan your hotel stay in the center of Florence at a good value click here. 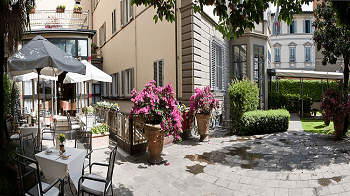 Located next to the cloisters of Florence’s Santa Maria Novella Basilica, Hotel Alba Palace is an elegantly renovated property with a peaceful courtyard. Santa Maria Novella Station is 1,650 feet from the hotel. Florence Cathedral and the Ponte Vecchio are a 10-minute walk away. Rooms at the Alba are decorated in a traditional style with renaissance prints on the walls. Each has a minibar, satellite TV and CD player. It offers free WiFi and air-conditioned rooms with Playstation2 and DVD players. To plan a Florence vacation with kids this hotel may fit your needs, click for details.